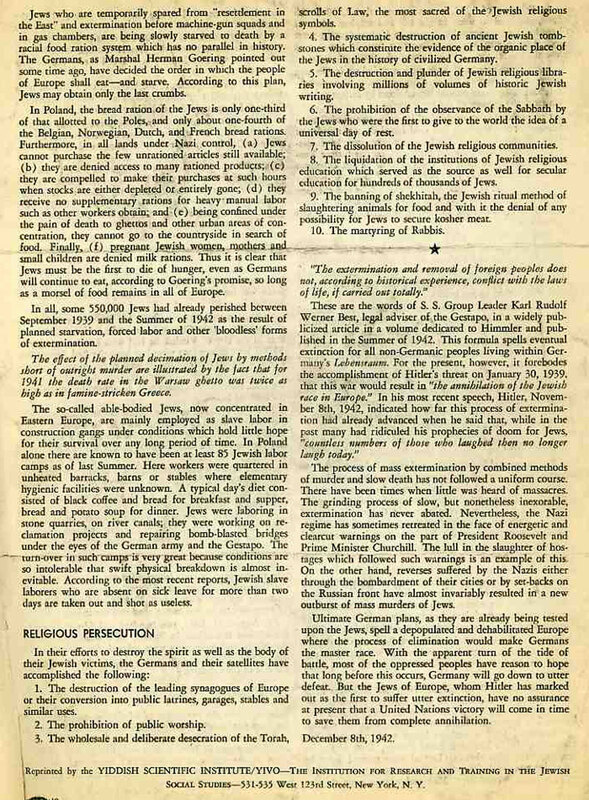 The following letter and memorandum were sent to President Roosevelt by the leaders of the American Jewish community, asking for him to speak up for the Jews of Europe and act against Hitler and the Nazis. The memorandum cites specific instances of violence and murder against Jews in specific European countries. We come to you as representatives of all sections of the Jewish community of the United States. 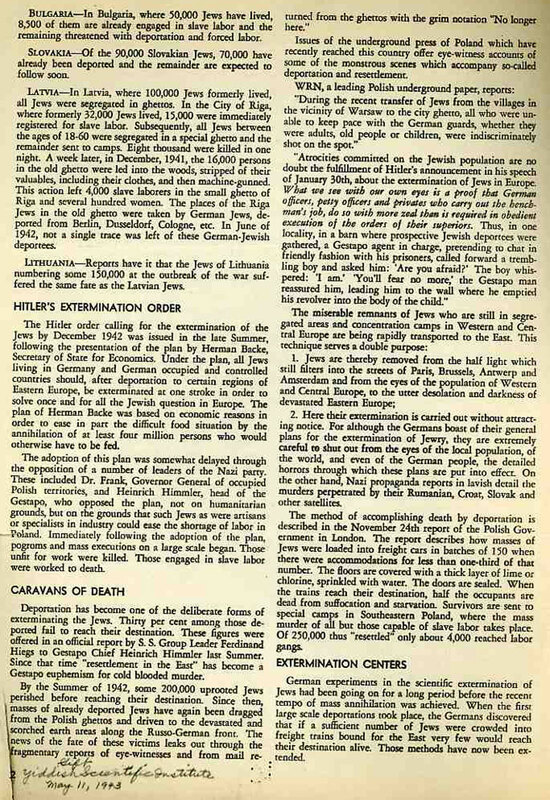 Within recent months all Americans have been horrified by the verification of reports concerning the barbarities against the inhabitants of countries overrun by Hitler's forces. To these horrors has now been added the news of Hitler's edict calling for the extermination of all Jews in the subjugated lands. Already almost two million Jews, men, women and children, have been cruelly done to death, and five million more Jews live under the threat of a similar doom. 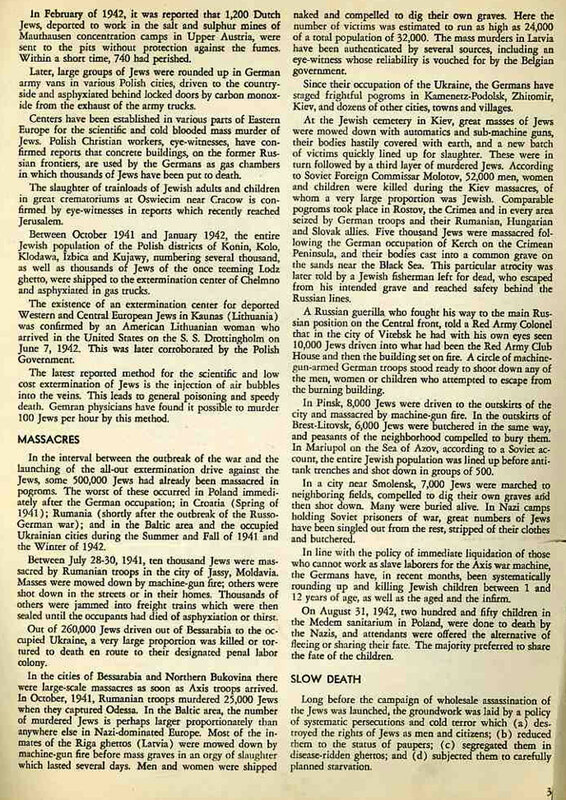 The record of these heinous crimes against the Jews in Nazi Europe is detailed in attached memorandum. Every device of a perverted and malignant ingenuity is being employed to hasten the process of their destruction. The result is a crime so monstrous as to be without parallel in history. The victims of his brutality are guilty of no crime save that they are the children of the people through whose divine law and through whose prophets the world was given the ideas which constitute a basic part of the civilization that the Nazis seek to destroy. Through the bodies of those innocents and defenseless victims the Nazis strike at civilization itself. Death and destruction follow every hero in the wake of the Nazi armies. Lands have been laid waste and their peoples destroyed or enslaved. In the midst of their suffering, however, the peoples of Europe are sustained by a hope that the victory of the Democracies will destroy the Nazi scourge, and restore freedom to the world. European Jews share that hope. But will they live to see the dawn of this day of freedom? Unless action is taken immediately, the Jews of Hitler Europe are doomed. In this hour of deepest anguish and despair we turn to you, Mr. President. You are the symbol of humanity's will to fight for freedom. Your voice awakened the conscience of the world to the great crime of Lidice. When hundreds of innocent French hostages were led to execution, yours was the prophetic word of democracy and human decency. We ask you now once to raise your voice – on behalf of the Jews of Europe. We ask you again to warn the Nazis that they will be held to strict accountability for their crimes. We ask you to employ every available means to bring solemn protest and warning to the peoples of the Axis countries so that they may be deterred from acting as the instruments of the monstrous designs of their mad leaders. 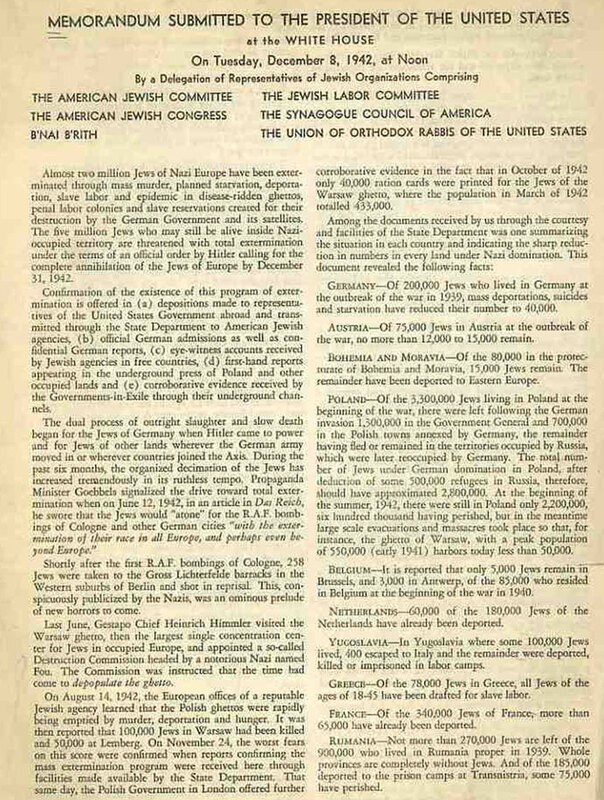 We urge that an American Commission be appointed at once to receive and examine all evidence of Nazi barbarities against civilian populations, and to submit that evidence to the bar of public opinion and to the conscience of the world. It is our earnest hope that such action as you initiate will be joined with similar action by all the United Nations. We are of the belief that you can speak the word and take such action as will strike fear into the hearts of the enemies of civilization and at the same time bring hope and faith to their victims. In this spirit, we appeal to you, Mr. President. Speak the word! Institute the action!